NO TOUCHY THE DECORATIVE HAND TOWELS! Lol! I only do it because it reminds me of my grandmother. It also makes things look pretty. Hand towel… folded neatly on or beside the sink (non decorative) is how I typically roll. The habit of tying a ribbon around the towel, as in your picture, has to take the biscuit, and, talking of biscuits, my mother kept a packet or two in the cupboard, for unexpected “Droppers in”. She would say to us” Those biscuits are not for eating”…a classic! Thanks so much for stopping by SomeKindaGood.org and liking my post! I’m so glad I ventured over to your blog to learn more about you. This post literally had me laughing ridiculously hard. It is so true about the decorative towels…and I bet you’re right about it being only in America. I had never given the subject any thought, but what a fantastic and hilarious observation. 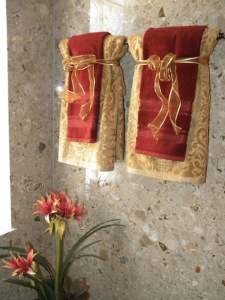 Towels “for show.” I will think twice next time I decorate my bathroom.